Nottingham Tree Services Prices and Rates are competitive amongst local Tree Surgeons that specialise in Tree Care services. ​Click here to call Notts Trees. To fell or remove a tree by yourself can be potentially dangerous. If you do not have the correct protective clothing, equipment and training, you could have a serious accident – it is much safer to hire fully licensed and insured, trained professionals. Our whole approach is built around a desire to provide an affordable solution to any of your tree related problems. We will visit your property to make a thorough assessment and give you an honest and realistic view of the situation. We will then produce a condition report and give you our opinion of the necessary remedial action. This assessment will be the basis for our competitive and professional quotation. We will discuss your needs and keep you fully informed of the progress during the course of the project. Tree Surgery can be an expensive process but at Nottingham Tree Services we believe that appointing a tree surgeon will be less hassle and cheaper than you might think. 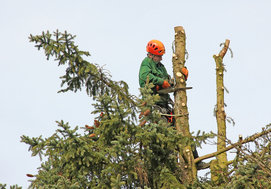 For a more detailed and accurate tree surgery quote, so you can see that we have very reasonable Tree Surgeon Rates please call us on 0115 824 9899. Or complete the form on the right, to arrange an appointment with one of our professionals.